Parodies and jokes about bad lawyer advertising are everywhere. Popular culture seems to thrive on helping perpetuate the bad lawyer stereotype by making fun of the crazy billboard and TV ads that many lawyers unskilled in the ways of good legal marketing seem to use. The only way to get rid of these negative stereotypes that show lawyer advertising as screaming, crazy "CALL ME NOW" ads is to stop doing it! The more lawyers that begin to take their legal marketing seriously and stop making the same old mistakes we as a profession have been making for years, the sooner we'll break free of that image. What do you do when there's no established path? Back when lawyer advertising first came about in the late 1970s, disco wasn't the only thing in style. The radio was still a primary news source for many consumers, television was becoming the advertising hot spot, and The Yellow Pages was still the go-to source for professional services. So when those two Arizona lawyers decided to try lawyer advertising just like other professional services, they created quite a stir. Once their battle was won, and the Supreme Court decided that yes, lawyers could advertise just like any other business, the race was on. Since no one else had really done any sort of legal marketing before, there was no right or wrong method. Lawyers tried what they figured would work and went from there. What resulted was a chain of parroting that only got worse in years to come. When other lawyers saw one of their competitors running a successful lawyer advertising method, they felt the peer pressure to do the same. Unfortunately, instead of taking the idea and making it their own, most just blindly copied the ad and switched out information. What resulted was a sea of copycat legal marketing attempts that did nothing but create confusion, especially to the client browsing through The Yellow Pages. How can you tell one lawyer from another if all their ads look and say the same thing? There's a word for copying other lawyers advertising: plagiarism. I'm not talking about straight word-for-word, that's just asking for trouble. But even just taking the general format of slapping your firm name, contact info, practice areas, and a picture of one of you in a suit in an advertisement isn't going to distinguish you from any other lawyer out there that is doing the same thing. Bad legal marketing is when you don't put enough of yourself into your lawyer advertising to make it unique to your firm and practice. You need to stand out to your clients and make them see that it's YOU they need, not just a lawyer. Keep reading for two more culprits in the world of bad lawyer advertising. Most attorneys start their firms assuming that being a really, really good attorney should, in an of itself, be a marketing advantage. Those attorneys believe that joining a whole bunch of committees and putting their name in lawyer directories is “marketing,” and they never bother to ask if there is a better way. Attorneys are catching on, however, and those who succeed have learned to leverage their current resources to create effective (and ethical) marketing. What they learned isn’t a magic pill or silver bullet, but a different approach to marketing that the elders of the profession haven’t considered. If you want a peek at what successful attorneys use to market their practice, this special Marketing Breakthrough kit is your logical next step. We’ve put together a FREE (and potentially life-changing) marketing kit for solo and small firm attorneys that will show you a better way to reach potential clients and get them excited to call your firm. 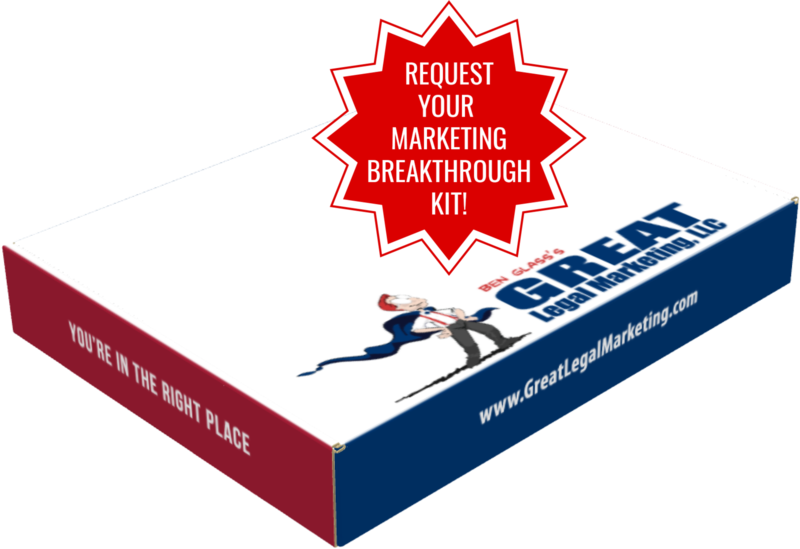 Request your Marketing Breakthrough Kit from Great Legal Marketing! Request Your Marketing Breakthrough Kit Today!